We had people over lunch on Sunday, including one friend who has diabetes. Apparently she loves puddings and is always naughty and ends up eating sugary things she shouldn’t. So I resolved to come up with a pudding suitable for diabetics. The other criteria was that it required lots of rhubarb. Ever since I mentioned at work that I’m featuring rhubarb recipes on the blog, everyone is bringing in their homegrown rhubarb for me, which is wonderful but the freezer is beginning to feel the strain. There are lots of ideas for diabetic-friendly desserts on the Diabetes UK website. 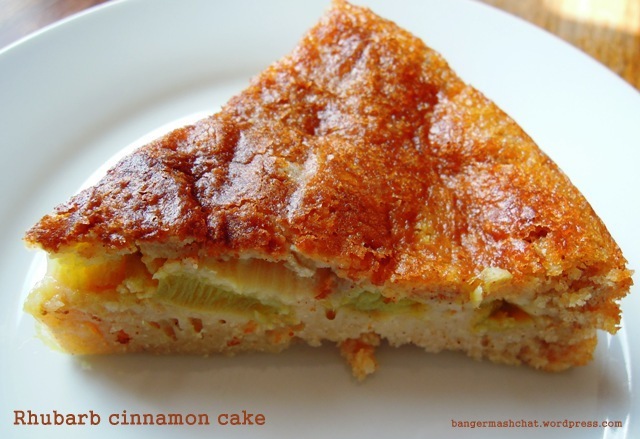 I came across an apple cinnamon cake, that I liked the sound of. 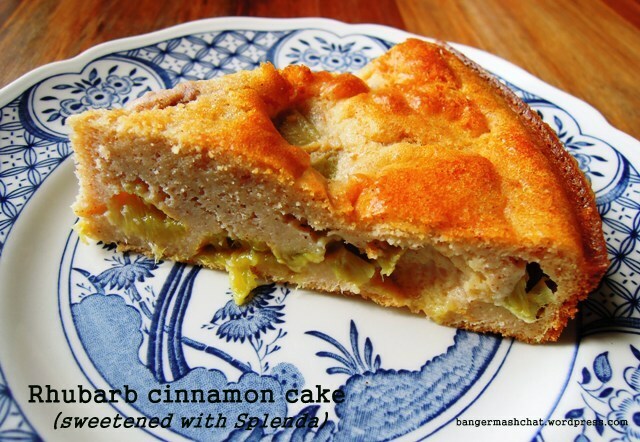 It uses a sugar alternative called Splenda and wondered if it might work with rhubarb instead. My husband was not enthusiastic when I told him about the fake sugar cake, and so I decided to make two versions, one with Splenda and one with normal sugar to test whether there was any perceivable difference. When it came to serving the cakes after our Sunday lunch (roast pork accompanied by, yes of course, a rhubarb compote), I started to wonder why I hadn’t opted for an easy, tried-and-tested pudding. But thankfully the cakes turned out well, although for some reason despite cooking them at the same time and rotating them in the oven, the two cakes were completely different colours. The Splenda cake was a lovely golden colour, while the normal sugar version was a deep brown. And both cakes got the thumbs up. No-one could taste any significant difference between the two, including Marge, our diabetic friend, who ironically decided to have a big slice of both! It’s a very moist, squishy cake, and served warm it’s really much more of a pudding than a cake, especially when you have it with creme fraiche or ice cream as we did. Have you baked with Splenda or some other sugar alternative? How have you found it? Sift the flour into a large bowl and mix in Splenda or caster sugar, baking powder and cinnamon. Make a well in the middle and whisk in the eggs and milk, followed by the melted low fat spread. Pour the mixture into the tin and bake in the oven for 30 to 35 minutes until golden or brown (depending on what sugar you use it seems) and a skewer inserted into the middle comes out clean. Turn out onto to cooling rack and leave to cool just a touch before serving. As these cakes feature rhubarb, lemon and spice I’m entering them into this month’s Recipes for Life challenge for the charity SWALLOW, which you may recall is hosted by me! And as rhubarb is such the seasonal fruit of the moment, I’m also entering it into Ren Behan’s Simple and in Season blog event, where you are guaranteed to find a whole host of delicious seasonal delights. This looks great & I’ll definitely give it a go with my Truvia for my husband. It’s a good one and I’d love to have a go at the apple version too. It’s great to have some sweet treats up your sleeve for friends and family with diabetes, isn’t it? Thanks Helen! I was thinking perhaps we should grow our own rhubarb too, but it seems so many friends have it in theirs we’ve had a steady free supply anyway! Thanks Jenny. Let me know what you think if you do. WE had rhubarb in the week and I wondered about using it in a cake. I will next time this looks lush! Thanks Fiona. It was the first time I’d tried it in cake and I’ll definitely be doing it again. Love your cake, we’ve eaten lots of rhubarb over the last couple of weeks, delicious and feels like it must be doing us good! Thanks Anna – I’m sure it must be doing us heaps of good! Looks delicious and will make a nice change from rhubarb crumble. Thanks Helen. I can’t believe we’ve been eating so much rhubarb and we still haven’t had a crumble yet! I was experimenting yesterday with using apple in flapjacks in an effort to use less sugar and butter; after seeing this recipe I may try rhubarb next time. I love rhubarb and can never have enough. Rhubarb is great in cakes – it really helps to create lovely moist cakes. But it does generally need a lot of sugar otherwise it can be rather on the sour side! Thanks Christina – will do!